The makers of Atlee’s recent blockbuster, Raja Rani, Fox Star Studios and The Next Big Film are joining together again for another project. 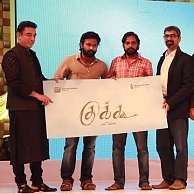 Titled Cuckoo, this film will be helmed by yet another new comer, Rajumurugan. Recently, Padmashree Dr Kamal Haasan did the honour of revealing the first look of the movie. Starring Attakathi Dinesh, Malavika and Aadukalam Murugadoss in the central roles, the movie will be produced by The Next Big Film and presented by Fox Star Studios. Santosh Narayanan will work on the music and PV Varma will crank the lens. Editor Shanmuga Veluchamy, art director T Ramalingam and choreographer Sheriff will also be part of the crew. When is Amara Kaaviyam releasing? People looking for online information on Cuckoo, Dinesh, Fox Star Studios, Kamal Haasan, Malavika, The Next Big Film will find this news story useful.